For our work, building artificial reefs, it is important to have good footage of what we do under water, so that you can enjoy the beautiful underwater world too. During our work we always have our hands full with coral, brushes or other tools. This is why we don’t want to take a large extended camera with us. A compact, easy-to-use action camera is a great solution. Only there are so many action cameras on the market now that you simply do not know which one is the most suitable for us. Since building artificial reefs is our main objective, we don’t want to spend too much time to process the footage afterwards into a beautiful video. That’s how we ended up at Paralenz. This action camera was designed by and for divers. The most unique selling point of this camera is that it adjusts the colour balance to the depth that you dive. For the less experienced divers, a small explanation: Water absorbs sunlight, so visible colours disappear as you go deeper. The first colour that disappears is red, that’s why everything in the water seems to become more blue. Photographers solve this by using flash light or by manually adjusting their camera to the depth where they are at that moment. That is how you get all the colour in the picture. You can also edit the photos on the computer afterwards, in a photo editing program or special designed programs such as Picture-Fix. Adjusting the colours of video recordings is a lot more complicated. Paralenz has solved that challenge very cleverly. They have an automatic colour correction built into their action camera. 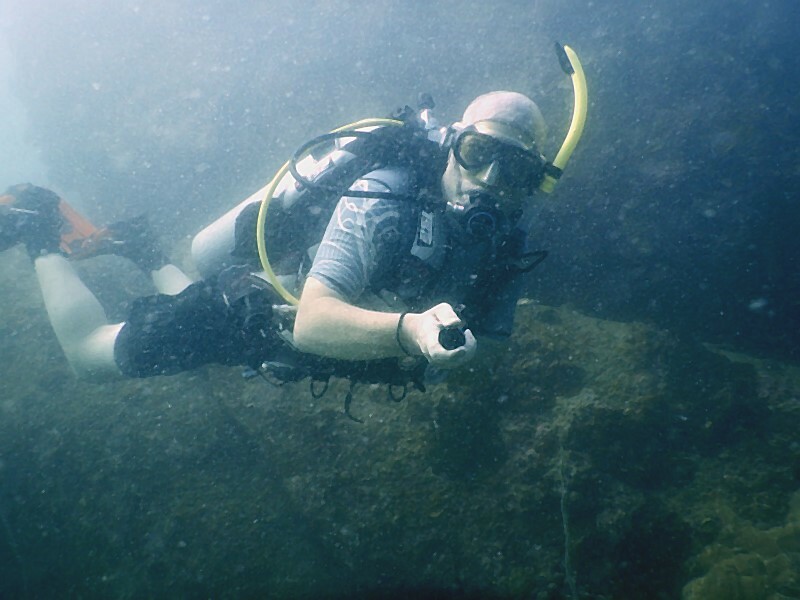 The camera measures how deep you are under water and adjusts the footage accordingly. You don’t have to do a colour correction afterwards to create a nice video. This saves you a lot of time when making a video with the raw footage. More about this later. The operation of the camera is different from the other action cameras. The video or photo mode is selected using the selection ring. Starting the recording or taking the photo is done by the button on the top of the camera. You have to get used to it, but after a while you have a good feel on how it works and it is very handy. The design of the camera is also very cleverly done. It is made in the shape of a torch and you also hold it that way. A lot easier than the average square action cameras. You can also hold it a lot more stable this way. Something most divers will probably not do, but what is ideal for our work, is the ability to put the camera in your sleeve of your rash guard / wetsuit. I leave the wristband on my wrist, turn the camera around, put it in my sleeve, so that I have both my hands free again. I do what I have to do and as soon as I’m done, camera comes out of the sleeve and I film the work I did. The only disadvantages of action cameras is of course that you don’t see what you are filming and these types of cameras are intended to make overview footage. You get to see a lot in the picture. That is also the case with the Paralenz. This is of course great if you want to film that whale shark that comes along. Only we are usually focused on small pieces of coral or coral fish. And there the Paralenz surprised me positively! It surprised me how close you can get to your subject and that you still have very nice footage. I am not an experienced product reviewer, but most reviews always ask the question: “Do you recommend this product?” I say: “Yes!” The footage are incredible and the organization behind Paralenz is also extremely helpful. If you have questions, they will answer you very quickly. Several divers who saw my footage have put Paralenz on their shortlist for a new camera. Have fun diving and filming. Subscibe to our YouTube channel to see out latest video’s.